An established leader in the field of both the appraisal and valuation industry, RDC Appraisals, has remained cutting edge at fulfilling all their customer’s needs with the highest integrity since 1990. The goal of this company has been to consistently provide exceptional quality at competitive market rates in regards to research, appraisals, valuations, and consulting services. RDC Appraisals uniquely stands apart from other appraisal companies because of their rock-solid principles of professionalism, upholding a courteous manner, and maintaining a high standard of ethicalness. www.rdcappraisals.com provides you with services that go way beyond traditional valuations and appraisals. This company has remained top-of-the-line for more the 26 years because of their accurate, quality research; timely, error-free appraisals; market competitive rates; exceeding industry standards; and innovative use of appropriate technology. They provide you with fast, accurate, and reliable results for Appraisals/Valuations of Property; Business, and Assets; Commercial Real Estate Appraisals, Residential Real Estate Appraisals, and Divorce Settlement Valuation just to name a few. RDC Appraisals required a website that would effectively promote their professional services across the globe. The layout of the website had to systematically present the viewer with the company’s appraisal services, resources and tips, current appraisal rates, information about the company, as well as an effective process for contacting the company and scheduling an appraisal. All information had to be presented in an intelligent yet comprehensive manner, thus allowing the viewer to absorb the material easily. Pulse Solutions was able to provide this professional company with an equally professional website. With its pale navy green background, easy navigation, and user-friendly approach, the website was a sure success. All information was presented in a crisp manner, allowing the viewer to easily understand the full services of the company. This was achieved by using PHP and WordPress platforms. 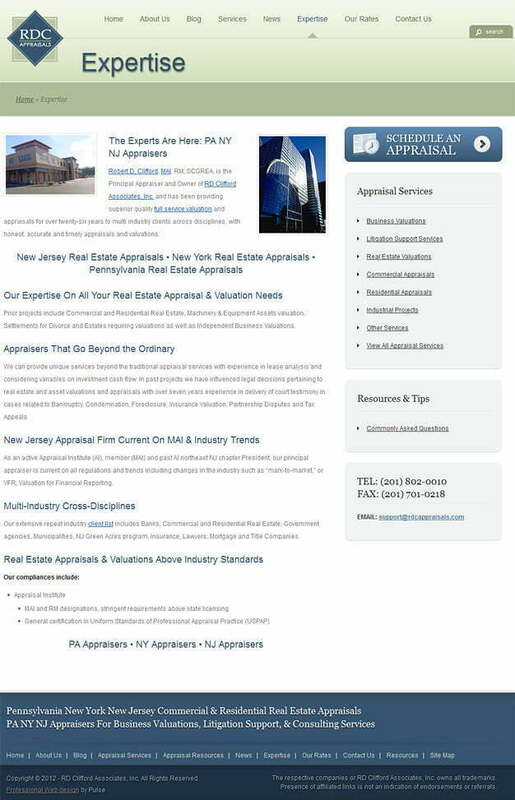 Through this website potential clients are able to better “grasp the ropes” of all that an Appraisal entails.